3.5 Litre Whistling Kettle. Whistling Spout. Polished High Quality Stainless Steel. 2.5 Litre Whistling Kettle. Great for camping or in the kitchen on the hob. Whistling spout. Follow all instructions regarding care washing and use. Compatible with camping gas stoves, electric hobs and radiant hobs, it has a whistling spout which notifies you once it’s finished boiling by emitting a high-pitched whistling sound. 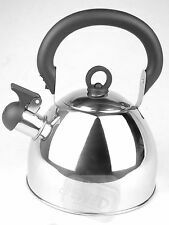 2ltr stainless steel kettle is ideal for camping. Whistling Delux Kettle. 3.5 Litre whistling kettle. Suitable for gas and electric hob styles. Whistling spout. RETRO LOOK. Stainless steel. Quality stainless steel construction. Need it fast?. 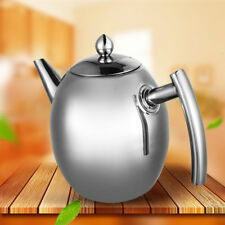 Aluminium Whistling Kettle. If they are still unsuccessful they will either Your Money Back. Whistling camp Kettle. 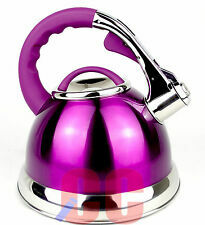 1 Litre apprx whistling kettle. Suitable for gas and electric hob styles. Whistling spout. To preserve beautiful finish don't boil dry or over heat and best not to use dishwashers. 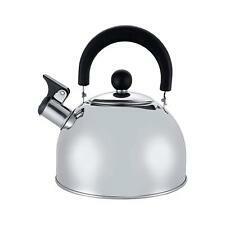 Made from strong, yet lightweight, stainless steel the kettle is very easy to clean. Even Heat Distribution - It is suitable for use with gas,electricity and vitro induction also the handle folds for easy storage and space saving. Whistling Delux Kettle. 2.5 Litre whistling kettle. Suitable for gas and electric hob styles. Whistling spout. Stainless steel. Quality stainless steel construction. Stainless Steel. To preserve beautiful finish don't boil dry or over heat and best not to use dishwashers. 3.5 Litre Whistling Kettle. Great for camping or in the kitchen on the hob. Whistling spout. Usable on gas, electric and radient ring hobs. Non-drip pouring spout and cool touch handle. 3.5 Litre Whistling Kettle. Great for camping or in the kitchen on the hob. Whistling spout. Usable on gas, electric and radient ring hobs. Non-drip pouring spout and cool touch handle. Holds aprox 3.5L. 3.5 Litre Whistling Kettle. Great for camping or in the kitchen on the hob. Whistling spout. Usable on gas, electric and radient ring hobs. Colour: stainless steel brushed. Heat resistant handel. Non-drip pouring spout and cool touch handle. 2.5 Litre Whistling Kettle. Great for camping or in the kitchen on the hob. Whistling spout. Folding handle. Size: 7" dia x Height 9" Height with handle folded 6.5'. Follow all instructions regarding care washing and use. Whistling function. Stainless steel body. Soft touch handle. 2.8 Litre capacity. Suitable for all hobs including induction. Colour: silver. 3.0 Litre Polished Stainless Steel Whistling Kettle will add a touch of class to any kitchen. It is suitable for gas, electric or induction hobs and has an easy grip, heat resistant handle. Whistling, non-drip spout. This stylish whistling stove top kettle will look good on your kitchen hob. It's also suitable for all hob types. Durable finish & whistling function. Buy with confident. You May Also like these. It is suitable for gas, electric or induction hobs and has an easy grip, heat resistant handle. This3.5 Litre Copper Stainless Steel Whistling Kettle byVoche® will add a touch of class to any kitchen. It is suitable for gas, electric or induction hobs and has easy grip, heat resistant handles. 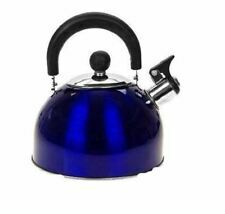 ThisKitsch Blue 3.5 Litre Capacity Stainless Steel Whistling Kettle byVoche® will add a touch of class to any kitchen. This classically designed whistling kettle is given a contemporary look to design your kitchen. Made using quality aluminium, the kettle is suitable for all hobs, making it ideal for all kitchens. Whistling Kettle 3L. Whistling Delux Kettle. 3.5 Litre whistling kettle. Suitable for gas and electric hob styles. Whistling spout. Stainless steel. Quality stainless steel construction. To preserve beautiful finish don't boil dry or over heat and best not to use dishwashers. This stylish whistling stove top kettle will look good on your kitchen hob. Durable finish & whistling function. If they are still unsuccessful they will either Baby & Nursery. Outdoor & Sport. It is suitable for gas, electric or induction hobs and has easy grip, heat resistant handles. ThisVoche® 3L Diamond Pattern Stainless Steel Whistling Kettle will add a touch of class to any kitchen. It is suitable for gas, electric or induction hobs and has an easy grip, heat resistant handle. 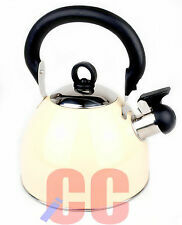 ThisCream Polka Dot Design 3.5 Litre Capacity Stainless Steel Whistling Kettle will add a touch of class to any kitchen. Handle is made of pp material, Annular groove design, can be anti-scald and anti-skid effectively. This stylish whistling stove top kettle will look good on your kitchen hob. Durable finish & whistling function. It's also suitable for all hob types. You May Also like these. This 3 Litre Capacity Stainless Steel Whistling Kettle will add a touch of class to any kitchen. It is suitable for gas, electric or induction hobs and has easy grip, heat resistant handles. Stylish matt kitsch blue soft touch finish. Great Range of Products. We will always do our best to resolve any issues. WHY BUY FROM US?. Genuine & Authentic. It is suitable for gas, electric or induction hobs and has an easy grip, heat resistant handle. Whistling spout. Made from stainless steel. Easy grip, heat resistant handle. You will need to know theItem Number (12 digit) for all correspondence. 2.5 Litre Whistling Kettle. Great for camping or in the kitchen on the hob. Whistling spout. Folding handle. Colour: Pale pink mat finish. Size: 7" dia x Height 9" Height with handle folded 6.5'. Follow all instructions regarding care washing and use. It is suitable for gas, electric or induction hobs and has easy grip, heat resistant handles. ThisBlack 3.5 Litre Capacity Stainless Steel Whistling Kettle byVoche® will add a touch of class to any kitchen. This classically designed whistling kettle is given a contemporary look to design your kitchen. Made using quality aluminium, the kettle is suitable for all hobs, making it ideal for all kitchens. Whistling Kettle 2,7L. This stylish whistling stove top kettle will look good on your kitchen hob. Durable finish & whistling function. If they are still unsuccessful they will either. This classically designed whistling kettle is given a contemporary look to design your kitchen. Made using quality stainless steel, the durable kettle is suitable for all hobs, including induction, making it ideal for all kitchens. 2.5 Litre Whistling Kettle. Great for camping or in the kitchen on the hob. Whistling spout. Colour: Pale blue mat finish. Folding handle. Size: 7" dia x Height 9" Height with handle folded 6.5'. Follow all instructions regarding care washing and use.